Join us for a warming, joyous evening of Christmas music – some familiar and some new! 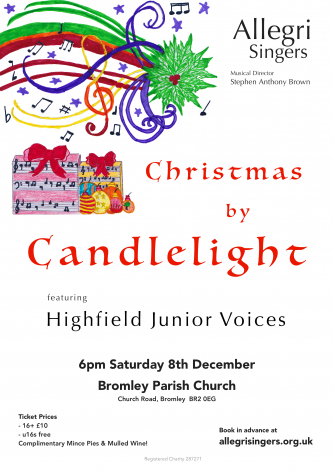 We have the great pleasure once again to welcome the wonderful Highfield Junior Voices to sing with us. There will be refreshments, including mulled wine, mince pies and plenty of festive cheer. We are delighted to be supporting Macmillan Cancer Support at this concert, as part of Choirs against Cancer, singing Gareth Treseder’s "The Sleep of the Infant Jesus" – find out more about Choirs against Cancer. The programme as shown does not include the Highfield Junior Voices solo items.